Chris and I are planning a trip to Portugal and Bordeaux next summer. Our trip starts in Portugal on a cruise. The cruise stops at many ports and finishes the cruise in London England. One of the ports we stop at is Bordeaux and that is where Chris and I will depart. After we had booked our trip our travel agent sent us an email. Anderson’s Conn Valley Vineyards was also going to join the cruise and host a small party. She asked if we would like to join and we said yes! Since we were not familiar with Anderson’s Conn Valley vineyards we decided to schedule a tour and tasting to make sure we enjoyed the wine. Our tasting was the second week in September. It was still pretty warm out so a cave tour was welcomed. As we arrived at the estate I noticed a special visitor. Antonio Galloni was in the estate house tasting the latest wines with the wine maker. I would have loved to peak in and say hi. I’m sure that would not have been a good idea. The cave tour was fun, we tried many wines and after the tour was done we bought a couple of bottles of wine to take with. Now trying the wine we look forward to meeting our hosts on the cruise and drinking more Anderson’s Conn Valley wines. The Pinot was medium with a ruby hue. We did not see any sediment in our glass or bottle. The Pinot smelled young and fruity. I could smell strawberry, blackberry, spice and red cherry. The wine smelled like a new world style Pinot Noir. My initial taste was the Pinot was dry and full-bodied. It was slightly tart. The tannins were medium and soft. It was very flavorful. As I tasted the wine it had silky rich complex flavors. The finish was short but soft and felt in my mid palate. 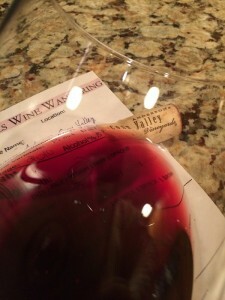 I rated the 2010 Anderson’s Conn Valley Pinot Noir three glasses. The Pinot Noir was pretty good, but in this price range I could think of a few other labels. One thing I like is the labeling on the cork. 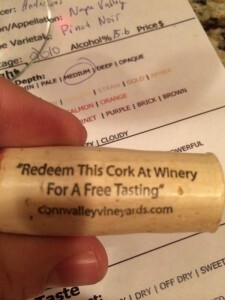 The cork notes “Redeem this cork at the winery for a free tasting”. That’s a great idea and it saves you $45 for the cave tour. And, it gets more people to come to the winery and try the wines.